BRAC NGO Job Circular 2019 has been published in daily job portal bd jobs.com also to get its job full details From ChomeBD.Com. BRAC is one of the world`s leading development organizations, dedicated to alleviate poverty and empower the poor. The goal of BRAC Skills Development Programme (SDP) is to ensure employable skills and decent job opportunities in line with the National Skills Development Policy (NSDP) and BRAC`s strategic goals with a particular focus on poor and disadvantage youth through Technical Vocational Education and Training (TVET).In recent time the NGO organization hire new job holder of Position Senior Program Manager./Head of Program. If you are interested ngo jobs in Bangladesh. 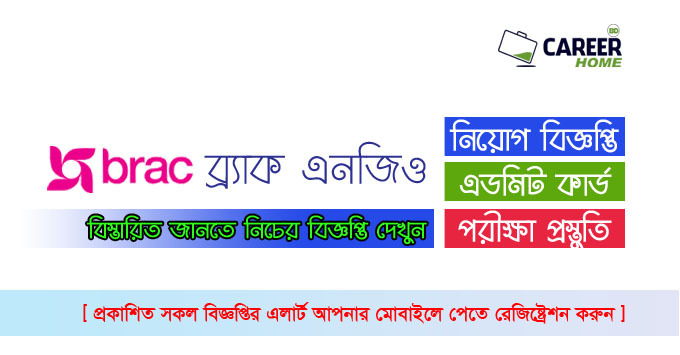 Get ready for BRAC NGO Job Circular 2019 and Check out. You can see full requirements with job circular image below. Apply Now!! For to want more jobs circular news keep connect with CHomeBD.Com is a newly up growing jobs circular website in Bangladesh that provides all types latest jobs information for people. our main aim help those people who are finding good job. so just stay with us as well as like our Facebook Page and Facebook Group, hope your will be must benefited. Thanks .